Several years ago Jean Barthélémy Chancel of Domaines Chancel Père & Fils in the Côtes du Lubéron region that straddles a buffer zone between the southern Rhône and Provence, contacted me and sent me some samples which I reported on here on wine-pages. Since then Jean has kept in touch, sending me the odd sample bottle of his wines to try. So it is time for another little round-up of some of these very nice French wines. 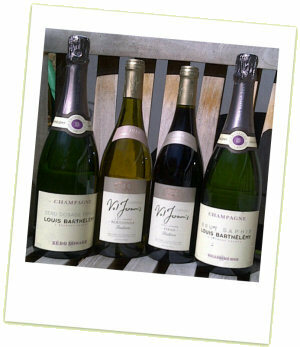 Chancel is a négociant and grower, producing estate wines at Château Val Joanis and Domaine Saint Andrieu, and making Champagne under the Champagne Louis Barthélémy marque. Château Val Joanis is situated north of Aix-en-Provence, on the site of an ancient Roman villa, the foundations of which are still visible. Jean-Louis Chancel bought the property in 1977, and began a “Herculean task of rehabilitation,” including the planting of 186 hectares of Syrah and Grenache for red and rosé wines, and Grenache blanc, Roussanne and Ugni-blanc for whites. A system of sustainable agriculture is employed, with chemical fertilisers replaced by organic supplements of vegetable origin. Erosion is controlled by systematically sowing the vineyard with ground cover plants, and spraying is kept to the necessary minimum on these limestone and gravel soils. Is Jean-Louis Chancel still alive? Should he be does he still live in London? I’m afraid I have no knowledge of that. Perhaps try contacting val-joanis.com and asking if they know?